Ah, the perplexing and mysterious 'Yenka'! Dance craze of the sixties, you remember. . . . No, neither do I. Have a look at the time honoured black-and-white-footprint diagram on the back cover. We tried actually doing it once, the floorboards never quite recovered. It seems to involve jumping, with both feet together, backwards and forwards a lot. Bloody weird if you ask me. 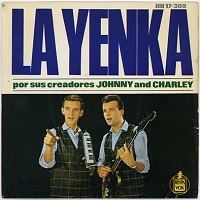 Still, Johnny and Charley, Spanish men with non Hispanic names clad in tartan waistcoats, waste no time or vinyl in their efforts to convert you to this strange practice. No less than four supremely Yenkable ditties adorn this EP. Interesting line up too. Melodica, guitar and timpani feature strongly. Nice. . Anybody out there more Hispanic pop-wise than me who can tell me if this was ever a popular dance in the night clubs of Burgos or wherever. . . I have two copies of this record so there must have been significant numbers of this record in London at some point. Unless I just got lucky. There would have been a lot of spilled lager, that's all I can say. It has been a (minor) hit in the UK: # 49 in 1965. But I've got it on a Spanish 60's Hits CD (bought in Spain), so it must be Spanish. Although the names of the 2 brothers are not really Spanish: Johnny Kurt and Charley Kurt. According to this site, the 2 Kurt brothers weren't spanish, but from the north of Europe - German, maybe? 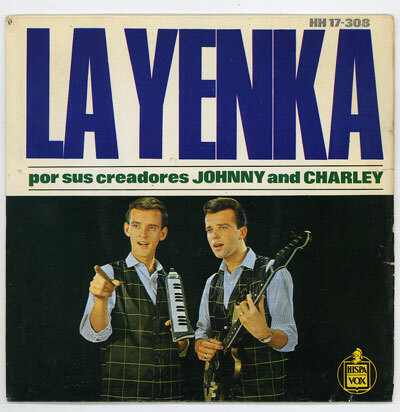 Johnny & Charley Kurt, un dúo llegado del norte de Europa hizo de este baile la canción del verano de 1965. And according to this other site, the song was the hit dance of 1965 (in Spain, I presume). 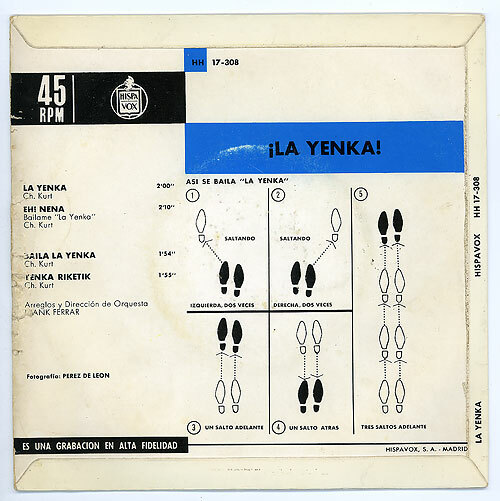 El baile de moda es "la yenka"
todo el mundo viene ahora sin pensar. delante, detrás, un dos tres. bailaremos sin descanso siempre más. delante y detrás, y venga ya. y qué graciosa es la yenka. And learn to do the yenka. any relation to Japanese "Enka" music? Thanks for the Youtube link. Shame it wasn't Johnny and Charley but it was suitably ghastly all the same. The footprints on the back cover lied! There's a lot of unheralded leg waving and hopping going on in that video. So it was actually relatively popular. Well I'll be. . . yenked. I always thought it was a Spanish act who invented this dance (It was covered back in the day by quite a bit of Spanish bands). My native language is Spanish so I can tell the two guys sing like Englishmen trying their best at Spanish (their accent is the dead giveaway, much like when Nat King Cole decided to record songs in Spanish). And yes, it was a weird dance. But what wasn't weird about the 60's anyway? The Swedish version, Letkis-Jenka by Lill-Babs, is worth a listen if you can find it. re: Johnny and Charley being from northern Europe. As soon as I heard these guys sing I thought "OUCH! *DUTCH* !!". Really, these guys have such a strong 60s/70s dutch accent it's silly. I can't find any info on them and I don't remember having ever heard them in Holland. Thanks for the Youtube link! La Yenka is composed by Rauno Lehtinen. It is based on Finnish "Jenkka" style of folk songs, which have German influences. Jenkka is a pair dance. It's modification "Letkajenkka" (Letkiss) is danced in one long line. The first version of Letkiss was recorded in 1961 by Finnish Letkiss All-Stars. The dance was huge hit in latin countries at 1965.